I've been working with a fellow named Gerald to get a version of Stylish for Opera going. His initial effort is pretty good, but I'd like to work out as many kinks as I can before promoting it on this site. The current version is available here. As this version is not hosted on the Opera extensions site, you will likely need to download it first, then install it from the local file. Try it out and post your thoughts in this thread. The source is also available on GitHub, if you're interested in that kind of thing. Excellent! Works awesome. Tried installing a bunch of styles, enabling, disabling, updating, removing... Everything in order. Then checked how the website recognizes it, works perfect. 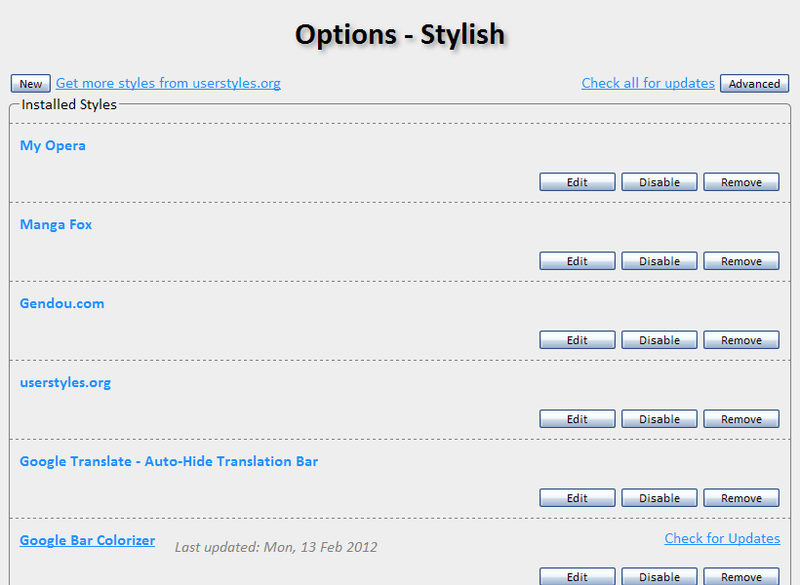 It recognizes when the style has an update available on the style's page, just like Firefox. It recognizes when the style is unavailable (Firefox App styles). It installs styles with multiple sections! Yey, no more need for userJS. All works as expected. Thank you for porting it to Opera :)>- Oh, and have a happy New Year! The latest preview release is available here. v1.3 may not work because I didn't figure out that the option string has been appended to the code URL and appended it repeatedly. All new releases will be available at https://addons.opera.com/en/extensions/details/stylish-for-opera/ . Opera users can use plain stylesheets out of the box for every website. So there never has been a need for UserJS. I generally find that's true of many things in Opera - you can do many things right out of the box, but not easily or efficiently. @DanMan styles with multiple sections as in http://userstyles.org/styles/60668/portableapps-com-clean unfortunately required userJS, until Stylish came to Opera. Opera out of the box only accepts one CSS file per subdomain, which is not necessarily wrong, but is a limitation. I clicked on delete do not delete, what to do? 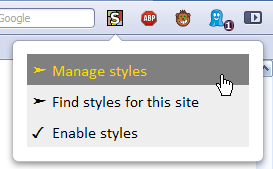 Stylish for Opera will not style the page, nor will it populate its menu with things like "Manage styles" or "Find styles for this site". Styles can't be manipulated in any way. Stylish will not style the page, but it will populate its menu with some items (though not all). Is there any way you can fix it, or work around it? It's a feature, not a bug. You don't want an extension running while you do your banking (how often do you thoroughly vet an extension before using it, after all? ), and it's far more convenient than a safe restart of the browser, as you have to do in Firefox. How unfortunate. Irrelevant whether it's Opera's feature or a bug. Is there any way it can be fixed, or worked around? Gerald? Yeah, my grandmother feels the same way. She doesn't understand the technology, and is afraid of hackers. No, it can't be "fixed". Might be so, but your mother and grandmother are irrelevant to this problem. Question was directed at Gerald. Are you Gerald? how about an update for the Using Stylish page ? I denote overlapping (overlay) between global and any Site style (enabled, on that website). Cannot Regexp lines work here? * Previously deleting @namespace and @-moz-document lines. Not sure I understand the question. What do you mean by "overlapping"? Sorry. I do mean avoid overlay, overlap, superposition, interference between a Global and Site styles. You could modify the global style to not apply to that site. See the last example in https://github.com/JasonBarnabe/stylish/wiki/Applying-styles-to-specific-sites .